Watford have confirmed the signing of winger Gerard Deulofeu on a five-year deal from Barcelona. The Spanish champions say they have agreed a fee of £11.5m for the 24-year-old, plus £3.5m in add-ons. 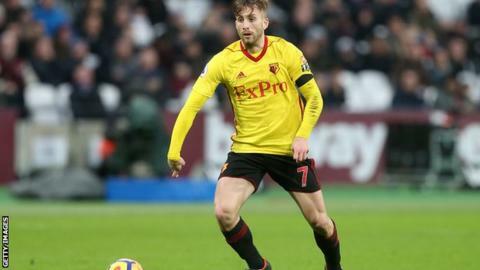 Deulofeu, who has won four caps for Spain, spent the second half of last season on loan at Watford, scoring once in seven Premier League appearances. The ex-Barcelona youth player has previously had two spells in the Premier League with Everton. He spent the 2013-14 campaign on loan at Goodison Park and returned on a permanent basis in 2015 after an unsuccessful spell at Sevilla. Following 18 months with the Toffees, Deulofeu finished the 2016-17 season on loan with AC Milan, then went back to Barcelona last summer when the Catalans activated a buy-back clause. The deal with Barcelona also includes a sell-on clause, according to the Spanish club. "We are very pleased to welcome Gerard back," said Watford chairman Scott Duxbury. "Our ambition to succeed and grow in the Premier League remains as strong as ever." Deulofeu's most recent international appearance came in Spain's World Cup qualifier against Liechtenstein in September.